We've officially decided to stay another month. 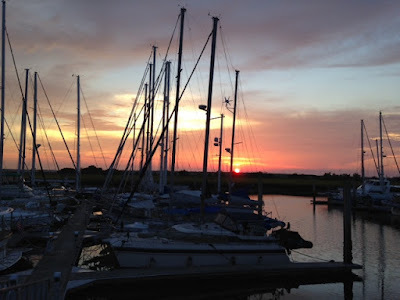 We're eager to start wandering again, but we're in the most logical place for hurricane season. The weather is hot, but not the worst we've experienced (air conditioning is still appreciated). The average high is 92F with a breeze off the water and humidity levels somewhere below the sauna we're used to in Missouri. It gets down into the 70's most evenings which is nice. We're still getting projects done, with lots of shopping within a bike ride. Last week's boat project seemed the most extensive yet (from a whole-boat-torn-apart perspective). Two weeks ago, our propane sensor went on the fritz. Our stove is propane. 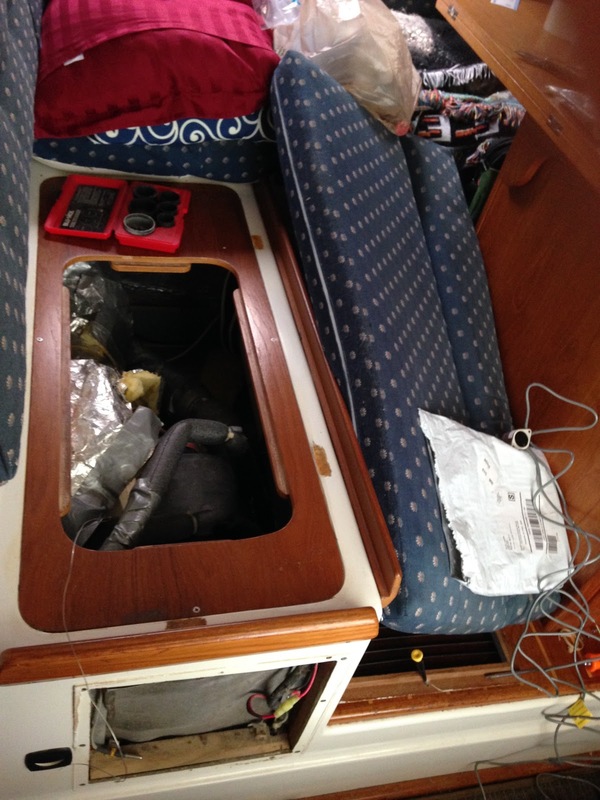 Propane sinks and can sit in the bilge and be ignited with a spark. Therefore, we have a propane sensor in each hull. Suddenly, we started getting dual false propane alarms--ie. not cooking and both going off at the same time (suspect). The first few times we opened up the boat to air it out, but then it started to rain. The spare sensor was hooked in and thrown out into the cockpit and it was still going off (that's weird). Sounded to me like we needed a new control panel. Captain ordered a whole new system (cheaper), but it wasn't going to arrive for 5 days, ie. no stove! Another bike ride to the grocery store for things that could be cooked on the grill (PS cooking hamburger in a skillet, then grabbing the handle will burn your hand--I've heard...) Finally, the new control head and sensors showed up. The Captain decided to replace everything since the stamp on one sensor said 1989! The beauty of being able to buy the same unit, was no drilling. WRONG! When the drill came out (from under my side of the settee) I moved into our berth. 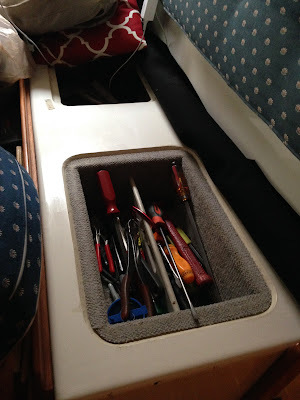 More tools were dug out of our berth. 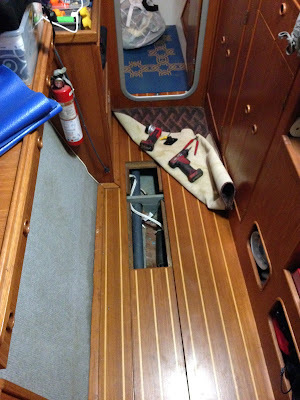 Then he opened his side of the settee to get at the wiring, then down into the port bilge to replace the sensor, then over to the starboard bilge. Suddenly, Amelia cried out like she'd been stepped on--Daddy had woken her up from her nap to get at more wiring under the settee. He brought her to me, but she wasn't having any of that. I tried to coax her with cuddling and a nap--even blocking her in with pillows and my body, but she acted like she was going to pee on our bed so I let her out. 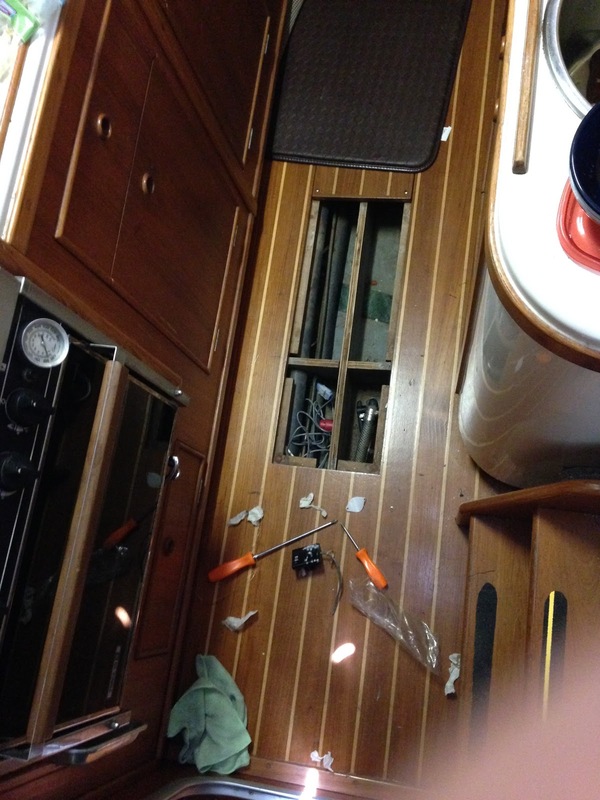 She promptly stepped down into an open bilge (because her vision isn't very good & not familiar with holes in floors!) At this point we were thrown out into the cockpit (with the "look"--you're in the way.) It took most of an afternoon, but the stove is functional again. The Captain departed to the clubhouse to get a beer. The Captain made it through his tooth problem. After a quick dental visit, that resulted in being referred to a specialist, he went back for what turned out to be a root canal. (Either he chose not to tell me this, he didn't understand what the dentist told him, or he was in denial). The specialist was excellent and he experienced very little discomfort during or after. The total cost was $2500 with less than $30 in prescription medication. (Whew!) He went back for a follow up, that turned into more drilling "because he couldn't get it all last time." Again, he claimed he didn't know that coming. All healed! On a side note, it's been suggested to me by the boss, that perhaps I should wear oven mitts. 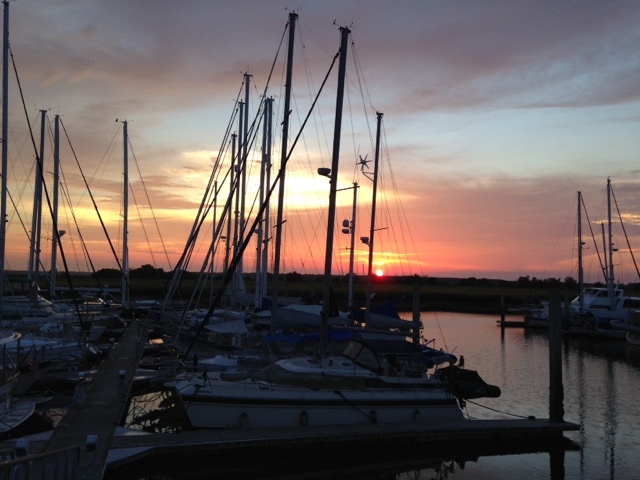 I made it through the introductory stages of living on a boat with minor bruises and toe stubbing. However recently, I've injured my "paws" several times. First I cut my hand chopping vegetables. I should point out that I've NEVER done that before, and yes, I've been warned that it is dangerous on a moving boat, but we're at a marina! Next was a minor burn on the grill (see above), but the worst I've ever had. (The Captain assured me that was his "sympathy" face but looked remotely similar to "you're-being-melodramatic" face). Then I tore a nail below the cuticle while docking (which seems to make even grown men wince). Finally, my first sewing injury--I jammed the needle below my nail while doing something stupid--I don't even remember how I did it. (We are both mildly concerned about the hotknife I ordered for cutting canvas!) Of course, you continuously bump all of these injuries and band aids are impossible. "AWHHHH, poor thing." Thank you.